Hello members, welcome to week 19! We have several fall recipes from the queen of home crafts, Martha Stewart. Last summer farmworker Elizabeth Brubaker brought glazed acorn squash for lunch one day, so I looked up a recipe for it to share. 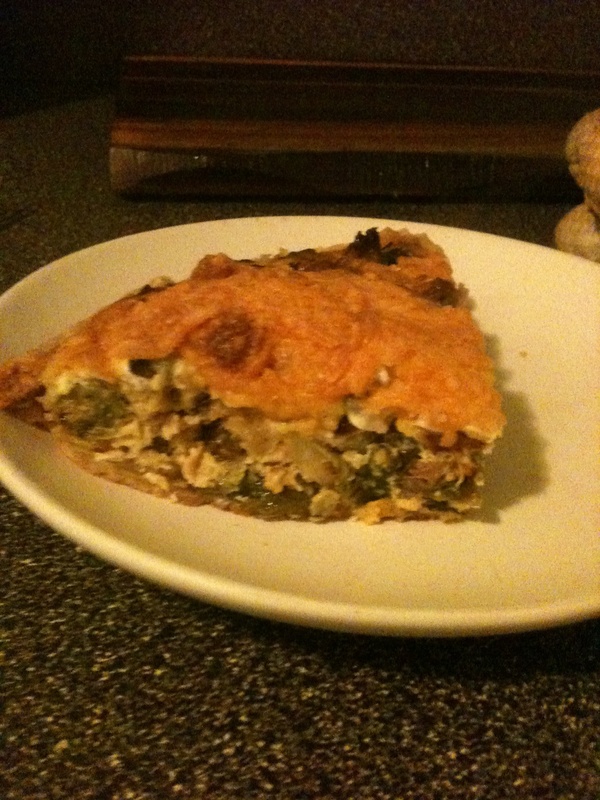 And finally a brussels sprouts apple quiche recipe. You may not think of fruit and dark green veggies going together but try it, you’ll like it! Preheat oven to 400 degrees. Slice squash just above the bulb. Slice the neck crosswise into 1/4 inch rounds. Cut squash bulb in half lengthwise. Remove and discard seeds (or save for roasting separately!). Slice each half crosswise into 1/4 inch half moons. Set a steamer basket in a large pot with 1 inch of water, bring to a boil. Add kale and steam until bright green and wilted, about 3 minutes, with cover on. Remove from heat, let cool slightly, squeeze dry. Butter a shallow 4 qt (9×13) baking dish. Arrange half of the squash in the dish, shingling pieces to overlap. Season with salt and pepper. Top with kale, add more seasoning, and sprinkle with half a cup of parmesan and 2 Tbsp sage. Place remaining squash on top, overlapping pieces, season again, pour cream over squash, and sprinkle with remaining sage. Cover tightly with parchment lined foil, bake until squash is tender, about 40 minutes. Sprinkle with panko and remaining parmesan, bake uncovered until golden, about 10-15 minutes more. Preheat oven to 425 degrees. Cover sweet potatoes and russet potatoes with 1 inch of water each, in separate sauce pans. Bring to a boil, salt generously, and boil for 8 minutes. Drain and return to respective pans. In a bowl, combine milk, cream and butter. Divide milk mixture between sauce pans, mash potatoes until smooth, season with salt and pepper. Spread mashed sweet potatoes evenly in the bottom of a 2 qt. baking dish. Top with mashed russet potatoes. Bake until golden, about 25 minutes. Meanwhile, in a bowl, combine flour and cayenne. Add leeks, toss to coat. In a medium sauce pan, heat 2 inches of oil over medium-high heat (thermometer should register at 350 degrees F). Working in batches, add leeks and cook, turning until crisp and lightly golden, about 1 minute. Transfer to paper towel with a slotted spoon. Season with salt. Sprinkle fried leeks over potatoes and serve. Preheat oven to 400 degrees. Wrap beets tightly in parchment lined foil, roast on baking sheet 1 hour and 20 minutes or until tender. Let cool completely, peel and cut crosswise into 1/4 inch slices. Increase oven temperature to 425, toss onion with 1 Tbsp oil and 1/2 of the thyme. Season with salt and pepper, arrange on the bottom of a 3 qt. gratin dish. On a cutting board, stack 1 slice each of potato, beet, and tomato. Season with salt and pepper. Repeat with remaining vegetables, keeping each stack separate. Transfer stacks to gratin dish, they can overlap slightly. Sprinkle with remaining thyme and drizzle with 2 Tbsp remaining oil. Cover tightly with parchment lined foil. Bake 30 minutes. Uncover, drizzle with remaining 3 Tbsp of oil, bake uncovered for an additional 35 minutes. Preheat oven to 475 degrees. Line a large heavy-duty rimmed baking sheet with parchment paper and set it aside. Using a sharp knife, slice squash in half lengthwise. Scoop out guts and seeds (compost the guts and roast the seeds separately). Slice the squash cross-wise into 1/2 inch thick half-rings. Place squash half-rings on parchment paper. In a small saucepan, melt the butter over low heat. Remove from heat and add maple syrup, vanilla, and cardamom, stirring to combine. Using a pastry brush paint the slices with half the butter mixture. Sprinkle with salt and turn over. Brush the other sides, reserving about 1 Tbsp of the butter mixture for after the squash is done baking. Roast the squash for 12 minutes in the oven. Use tongs to flip the squash and roast 10 to 12 minutes more. Remove the squash from the oven, butter with the remaining 1 Tbsp of butter mixture, and serve. Bring a large pot of water to a boil. Lightly season with salt and throw in the cleaned and trimmed Brussels sprouts. Boil for about 5 minutes or until bright green and tender. Using a slotted spoon transfer the Brussels sprouts to a bowl of ice water. Leave there to cool completely. Then drain into a colander and allow to air dry. Note: You can skip this step and just fry the brussels with the onions if you’d like. Heat a large skillet over medium-high heat. Melt the butter and add the sliced shallots and minced garlic. Cook for about 5 minutes, stirring constantly, until tender and just beginning to brown. Add the drained Brussels sprouts, stir and cook for about 5 to 8 minutes or until they brown. Season with salt, black pepper, crushed red pepper flakes and nutmeg. Stir every once in a while, keeping an eye on them so that they don’t burn. You might have to lower the heat. Add the diced apples and cook for another 2 to 3 minutes. Remove from flame and allow to cool. In a large bowl whisk together the eggs and half and half. Season with salt and pepper and whisk once more until completely combined. Arrange the sautéed veggies on the baked and cooled crust on a single layer. Pour the milk and egg mixture over the filling. Sprinkle with shredded gruyere cheese. 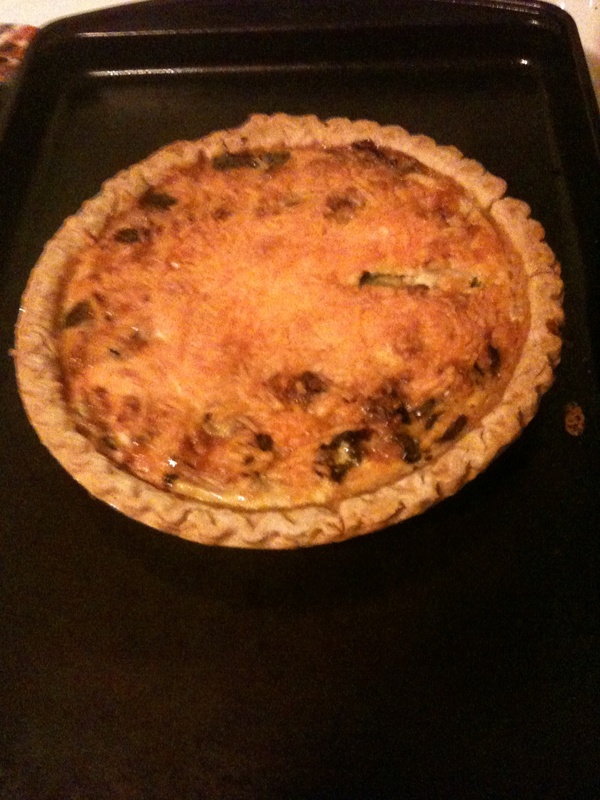 Place the quiche on a baking sheet and bake for about 30 to 35 minutes or until puffed and golden brown. Remove from the oven and allow to cool for about 30 minutes to set. Cut and enjoy!